It is a summer festival held in Tokushima City, the prefectural seat of Tokushima Prefecture in Shikoku from August 12th to 15th every year. It is a large scale festival of 400 years history where participants in Yukata hold various musical instruments such as gongs or drums and parade around the town. Various groups show dances in some streets where pre-paid seats are arranged. Tickets are purchased by reservation, but you can watch the festival free of charge. 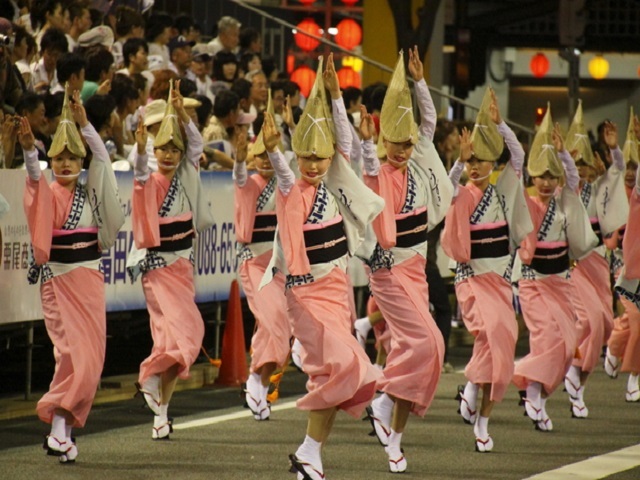 Awa Dance Festival has been a nationwide festival which is not only held in the local area but also in Tokyo etc. Because the reservation of the hotel just before the festival is difficult, an early reservation is recommended. Trains run from Okayama Station of the Sanyo Shinkansen of Chugoku Region to Tokushima Station passing Seto Great Bridge via Takamatsu City in Kagawa Prefecture. Limited express trains run from Takamatsu Station every one hour. Because bus service uses the same bus terminal as Naruto Whirling currents access, transferring is convenient. 1 hour from Okayama Station to Takamatsu Station via the Honshi Line train with 1 train per 30 minutes, to Tokushima Station for 1 hour 10 minutes via the Kotoku Line with 1 train per hour. ＊Refer to the access to the Naruto Whirling Currents. 1 hour 50 minutes from Shin-Kobe Station to Tokushima Station. 2 hours 30 minutes from Oska Station to Tokushima Station. There will be severe traffic jam on the road during the festival period, using public transport is recommended. 2 hours 20 minutes from Okayama Station, 1 hour 10 minutes from Takamatsu Station. 2 hours from Kochi Station. Organization for Promotion of Tourism in SHIKOKU.